209 Madison Street is a one of kind Queen Anne Victorian built in 1902 located in the Garland Hill Historic District. This home needs some TLC and once restored will be a showplace once again! The original details in this home cannot be duplicated. 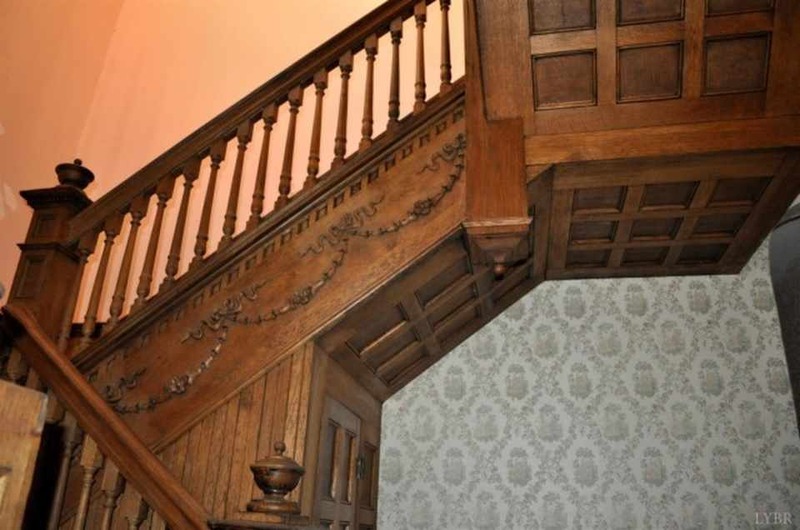 The ornate detailing in the woodwork is stunning and has been lovingly restored. 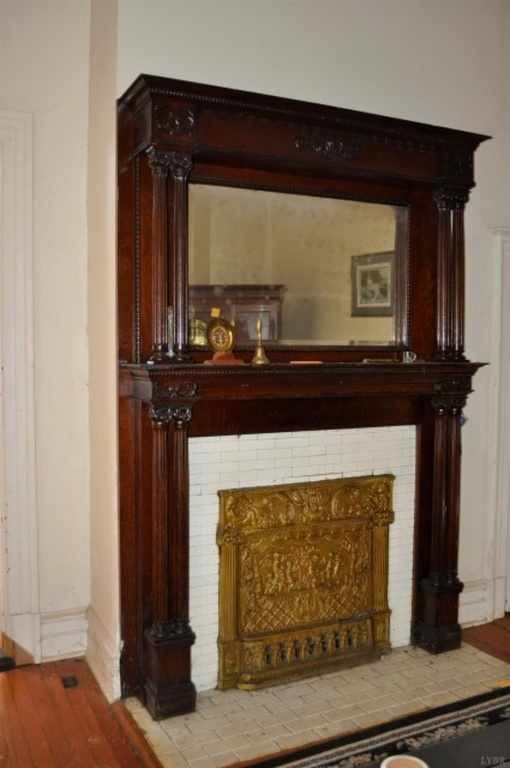 Original mantels remain in place. Master bedroom with bath updated in the 1980s. Kitchen was also updated in the 80s. Bedrooms with generous closet space! Home has been insulated and has storm windows. Walk up, floored attic with views of the mountains. Attic could be converted into more finished square footage. Own a piece of History in the Garland Hill District. Priced below assessment, so don't wait...it won't last long! Thanks John for the share. You’re very welcome, it got my attention as well. Great house, great streetscape, and great price in the middle of a historic district. Outstanding mansion right across the street. Were we to have a pending sale of our Texas home, I might be looking at this right now, but it would be a great deal for someone. Someone had posted it on FB and one viewer said they were going to see it today. 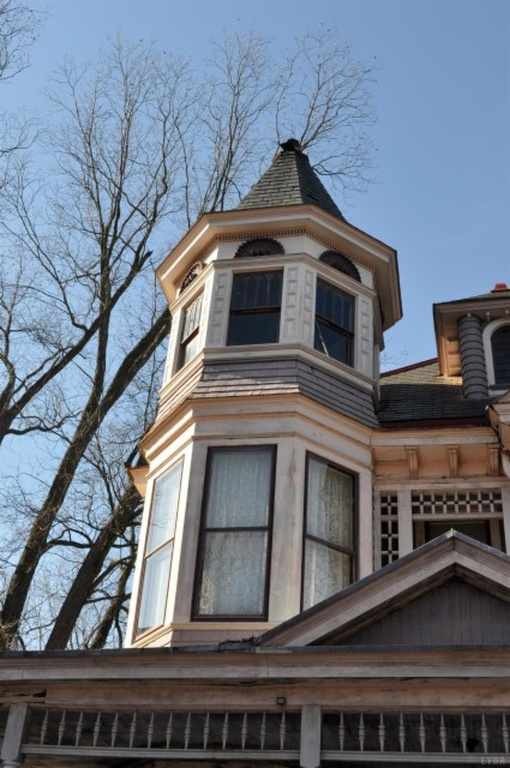 By the way, that super bargain priced towered Queen Anne in Portland, Indiana ($14,900 but it was missing a porch and a few other issues) has a pending on it. Those Old House Dreams fans who are actively looking for their next home should not delay checking out a property when its bargain priced and in a decent area; nothing is more frustrating than finding your dream home and having the resources to buy it but then being informed someone else has just had their offer accepted. 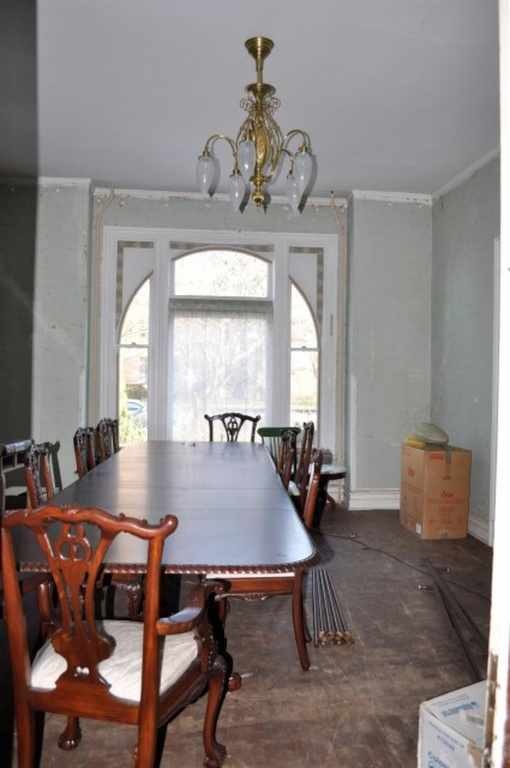 This house needs some work but the period details suggest great potential. Oh, one other thing, just wondering if this might be a design by George F. Barber? John, the street view is, indeed, lovely. Oh my! Ross, Lynchburg, VA, has been on my old house “radar screen” since this one was posted about 2010/2011: http://www.oldhousedreams.com/2011/10/07/1895-queen-anne-lynchburg-va-179900/ That massive circular stained glass landing window remains one of the finest of its kind I’ve ever seen. I truly “lusted” after that house but as often happens, the outstanding details that appealed to me also appealed to others. I only hope the new owners sensitively restored it back to period perfection. This 1902 house has the same potential in my opinion although it’s somewhat later and incorporates Colonial Revival design elements. The streetscape is the kind that most old house buyers hope to have…brick and cobblestone streets lined with restored and unrestored period homes; beautiful gardens and landscaping; old iron fencing, all combining together to make an authentic ambiance of the past that can’t be replicated. I’m already envious of the next owners. Once again John, your keen eye has recognized yet another spectacular Barber designed home. 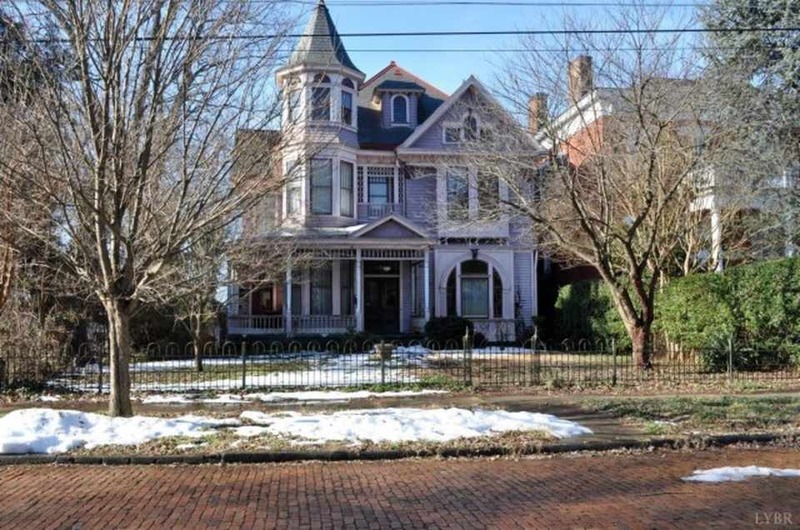 This home is quite fascinating in that it is essentially a re-do of another Barber designed home, built for George M. Jones, a very prominent citizen of Lynchburg, several years earlier. 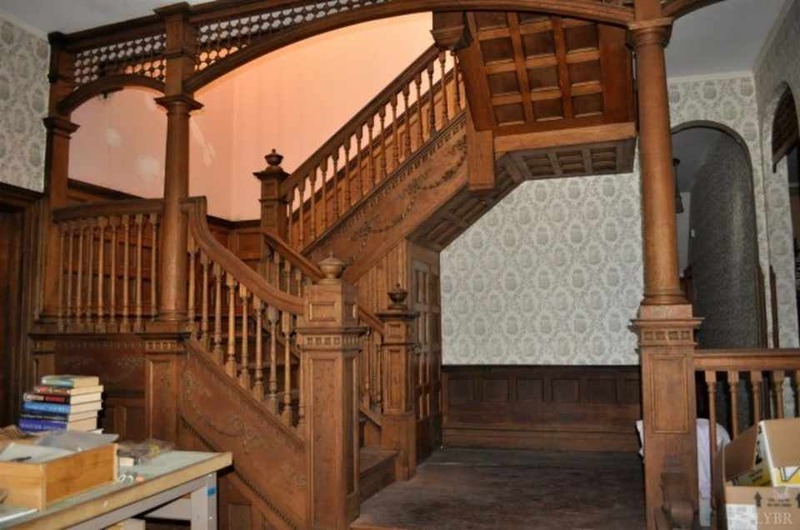 The Jones house was quite spectacular when it was built in 1896, but since then has been completely remuddled and now exists in an almost unrecognizable state. As I mentioned, this home was patterned after the Jones design, although smaller, perhaps built by a friend or business associate of Jones. What a gem! Thanks for sharing this beauty. Thanks for the identification, Chris. The interior details were spot-on Barber (lots of entry “drama”) and the exterior had the kind of idiosyncratic balance of massing and forms Barber designed houses often had. That arched front bay window with the symbolic “keystone” repeated in the Palladian window in the top gable is a Barber detail found in several of his designs. But as we know, Barber had imitators who freely borrowed from his design ideas so I was hoping you might weigh in with your Barber expertise. Many thanks for doing so! I know Lynchburg has a federal district where the homes can receive federal funding for renovations. It would be wise to find out before buying to get help restoring this beauty. Rockin Auntie, (cool name) I noticed this house is in a local historic district (likely a National Register of Historic Places district) but usually any grant money has to come from the City or in rare occasions, the state. Federal incentives for rehab usually are in the form of tax credits and they apply to commercial use of historic properties, not private homes. Sometimes, cities do have some grant money for the restoration of certain properties. (as in St. Joseph, MO where I lived and worked for a couple of years) The grants are given AFTER all rehab work is completed and signed off on by the local preservation officer or planner. I’ve never visited Lynchburg or even Virginia, but family genealogy on my Dad’s side says a direct ancestor arrived from England and settled in Albermarle County in 1704. Quite a few individuals with the same surname still reside in Virginia (with variations in spelling) but all of the same family. Should the hoped for sale of our Texas Victorian coincide with the availability of this house, it might be worth a trip out to Lynchburg to take a look at it. In the meantime, I hope it goes to caring new owners who will preserve and maintain its lovely features. Surely there are more than 3 bedrooms in this?? My 1894 house is almost 9,000 square feet on four levels. Yet it has but three bedrooms. There is also a “sewing room” (which is large and could be a bedroom), and a library. There is also a vast stairhall. Vast. And a “reception room”, in addition to a parlor and dining room. All the rooms are huge. That fence! That brick street! That house next door! And I haven’t even looked beyond the first picture yet! Something about this one appeals to me. 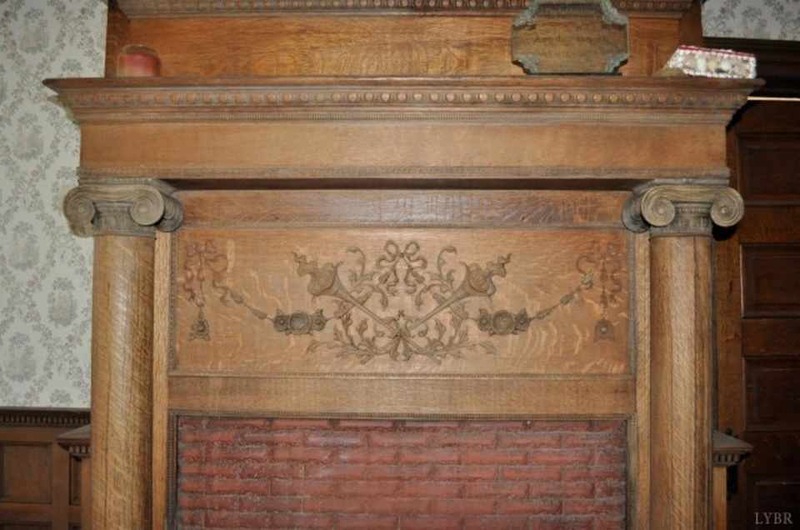 Maybe the intact fretwork, or the ornamentals on the woodwork. It seems like a family home, a place which has seen weddings, funerals, children playing, first dates, family suppers, and relatives coming for the holidays. Oh the memories in that wonderful old home. Someone raised their lil family there, shared many good time. Times we will never know. Thank you for sharing. The dining room and bath are divine. Also, Lynchburg is a pleasant city. I went to school there — the now defunct Randolph-Macon Woman’s College. Now THAT is a staircase. This is really really nice one. Highly desirable area with a lot of restored homes, priced well, still some work to do but doesn’t look like someone would get bogged down on this one. 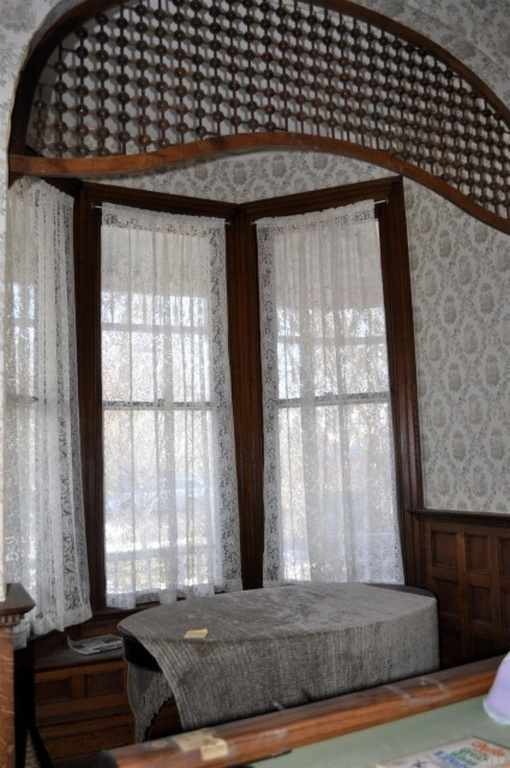 I’ll bet at one time there were some great jeweled art glass panels installed around the clear center pane of the arched top dining room window. 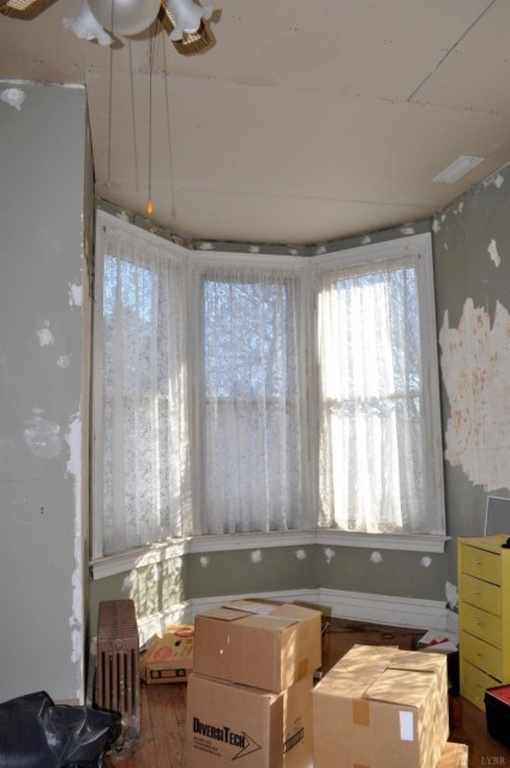 Needs basic renovation, well worth the asking price. Ernie, I completely agree. Art glass windows were a mainstay of Barber designed houses. If older photos exist, it might be possible to identify a design and a good stained glass artisan could replicate missing panes. It’s always a shame that folks took out art glass windows from Victorian homes. 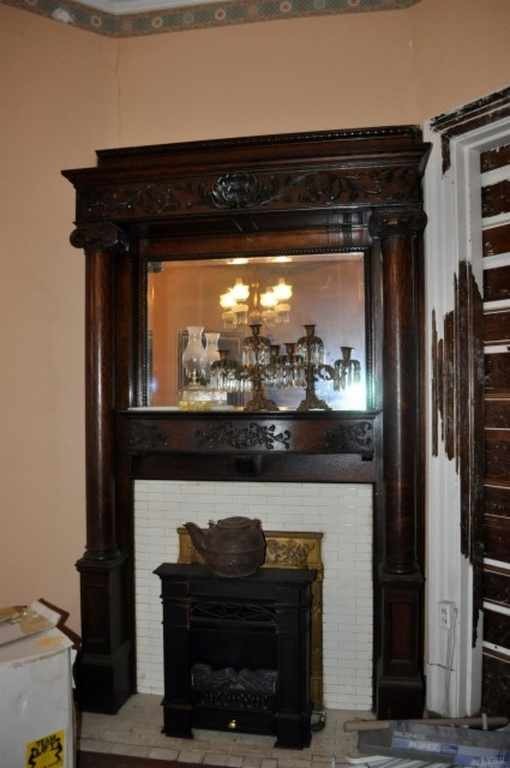 Unless they were by a famous maker like Tiffany or John LaFarge, common windows of the period usually fetch little money from dealers who buy them. (especially if they have cracked pieces or the lead came is sagged or bowed) To replace them with new replica windows will cost hundreds or even thousands of dollars but their theft or by-owner removal continues. (Think about all of the vacant houses where copper/brass plumbing and wiring are stripped out by thieves-anything of resale value including architectural pieces are also considered fair game) This house is not perfect; if it were, even in Lynchburg where there is a relative abundance of old houses it would be priced much higher. However, from the favorable comments, it appears most of us here consider it a diamond in the rough just needing some polishing to shine again. That staircase… Dead. I’m dead. 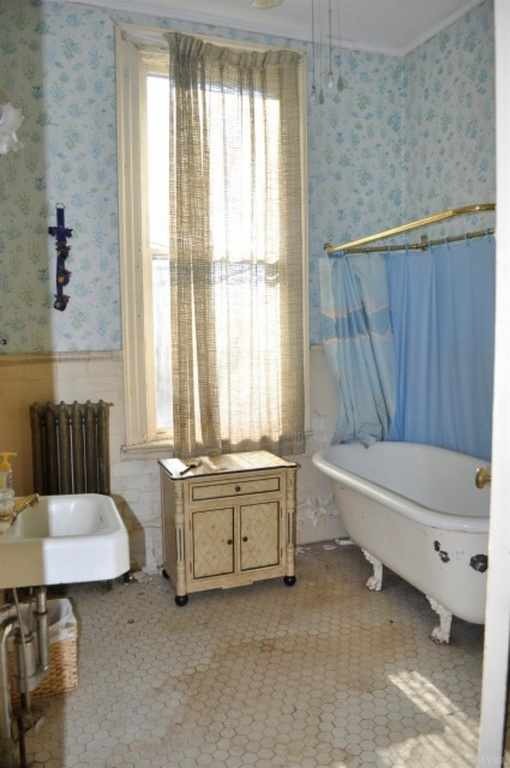 I want to grab a bucket and get to work on that tile floor in the bathroom. The ultra-high ceiling in there is so good. Everyone needs to click “street view.” Seriously. Do it. What a stunning house! 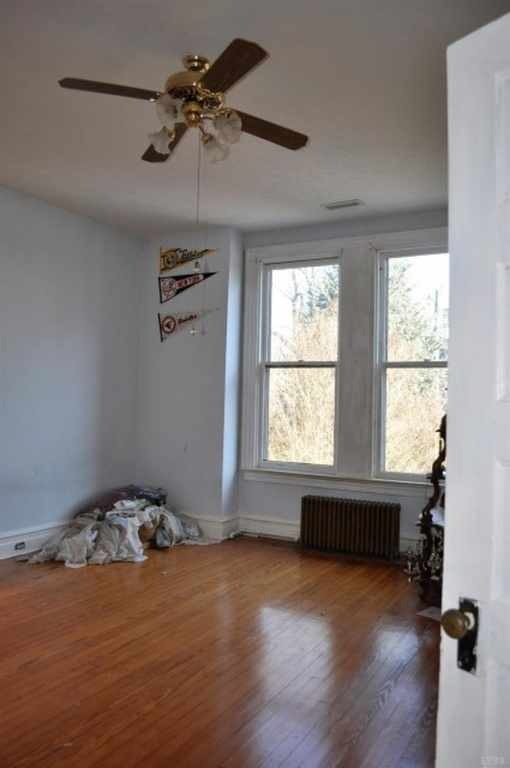 The street views make this look like quite a buy. I love the Garland Hill district; I’ve walked its streets many times. I live in Richmond but like Lynchburg so much that I bought a house there ten years ago, which I rent out. If not for family and friends here I would have no qualms about moving to Lynchburg. During the 1890s tobacco boom it was one of the richest cities in the country, and the architecture in the core reflects it. There’s a huge abundance of relatively affordable historic homes. Also, the city school system is good and there is a decent employment base. My wife went to Randolph-Macon Woman’s College in Lynchburg, now co-ed and operating as Randolph College. Thanks for the information, Matt. Since you are familiar with the area, do you know if this property has off-street parking, or a garage/old carriage house? If it lacks off street parking, that would probably be a deal breaker for many. Otherwise the setting is one of the most picturesque of any urban locales I’ve seen. There’s an additive for exterior paint that Id use to put a coat on this house. They are called ” micro balloons ” they are a hollow ceramic sphere. 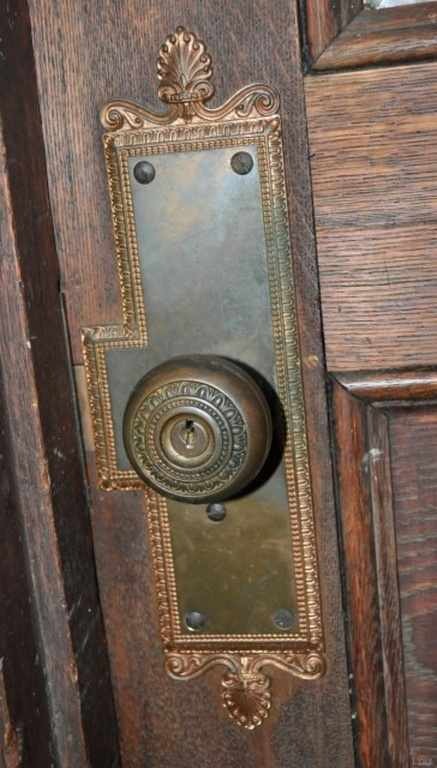 Offers decades of protection and goes easily over these old Victorians. Looks great and prevents further rot of wood siding. No surprises there. It’s an excellent house needing some TLC but is priced fairly for the features offered. Location I believe is also a big factor in its appeal. Congratulations to the prospective buyers; I hope they appreciate what a gem of a house it is and restore it to perfection. Look at that grill work!!! Above asking? Sounds like maybe more than one offer came in. Still, considering all that is offered in this house as well as the picturesque neighborhood, it would be difficult to make a convincing argument it was overpriced. Congratulations to the new owners; I hope they restore it to its original beauty.